It’s your life. Shouldn’t it be spectacular? LifeReader is committed to helping you live up to your full potential by promising the very best online psychic reading experience possible. The company, launched in 2009, claims to hand-select each of their psychic specialists, who must go through a rigorous quality assurance process. At any given there, there are approximately 50 online psychics who are ready to connect with you by phone, chat or email. How do you connect? Anyone already familiar with psychic networks will quickly feel comfortable with the familiarity of this site. And those who have never teamed with a psychic before will discover that it’s easier than they ever suspected. 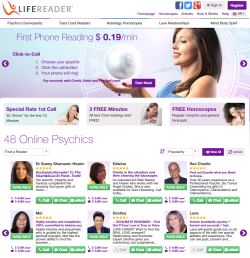 First, you browse the home page listing or choose on of the top-listed categories – psychics clairvoyants, tarot card readers, astrology horoscopes, love relationships and mind body spirit – to find a psychic reader. LifeReader psychics give you everything possible to help ensure you’re making a good connection, including a lengthy personal statement that provides insight on how each psychic discovered his or her purpose. There’s more, too: experience, feedback from past customers, number of readings accomplished, and rates per minute. You can easily filter psychics by their popularity, star rating and prices (either low to high or high to low), or ask to see the newest psychics first. One drawback is you are not readily able to filter by tools or style of reading; instead, you must carefully browse the psychics that appear on your screen and decide which one is the best fit. Once you spend some time upfront, the rest is a cakewalk. Decide how you wish to receive your reading: by phone, text, or chat. Click the appropriate button, pay securely with credit, debt or prepaid card, and that’s all there is to it. Afterwards, you’re invited to leave feedback for other customers through a popup screen. Whether you’re looking for insights in your love relationship, seeking career guidance, or simply needing to gain clarity on your life journey, you can find it at LifeReader. All psychics and clairvoyant advisors rely on their preferred mediums and methods – from dream interpretation to channeling spirits to consulting crystal balls, astrology or Tarot cards. These methods have been practiced since ancient times and LifeReader psychics continue in these time-honored traditions. At LifeReader, you’re in control. You pay only for the minutes you use and you determine how long the reading will be. LifeReader representatives will ask you to actively confirm your per-minute rate and ask if you are eligible for a special rate. It becomes quickly evident that astrology and horoscopes are a major part of LifeReader’s services. A free daily and monthly star sign horoscope provides both regular romantic and general forecasts and even the outlook for weekend love. Unlike other sites, they also offer a free love compatibility test to find out if you are compatible with your “special someone” and a free Love Tarot Reading to help you make the most of each day. There are also a number of articles, ranging from Soul Mate Love to Reincarnation, written by some of the psychics themselves. The network doesn’t tout its satisfaction guarantee; in fact, it is deeply hidden under Terms and Conditions. There’s a reason for that, since their satisfaction commitment is nowhere as strong as others I’ve seen. If you’re unhappy with your reading, you must request a refund through email within 72 hours of the Advice Session ending. The onus is on you to state the date of the reading, the name, and the consultation fee. It is then entirely up to LifeReader whether to grant you a refund or not. If they decide to honor your request, their refunds will not excellent the equivalent value of one 15-minute consultation and special rate consultations are limited to the value of the special rate. You need to know going into your reading that there is a good chance you may not receive your money back if you are less than satisfied. That being said, LifeReader does work hard to limit your financial exposure. They offer a special introductory rate of only $0.19 a minute for the first 10 minutes so you risk no more than $1.90 for your first reading. All text chat readings start free. If you make a psychic connection, you can continue that connection with confidence after getting your feet wet with your initial consultation.